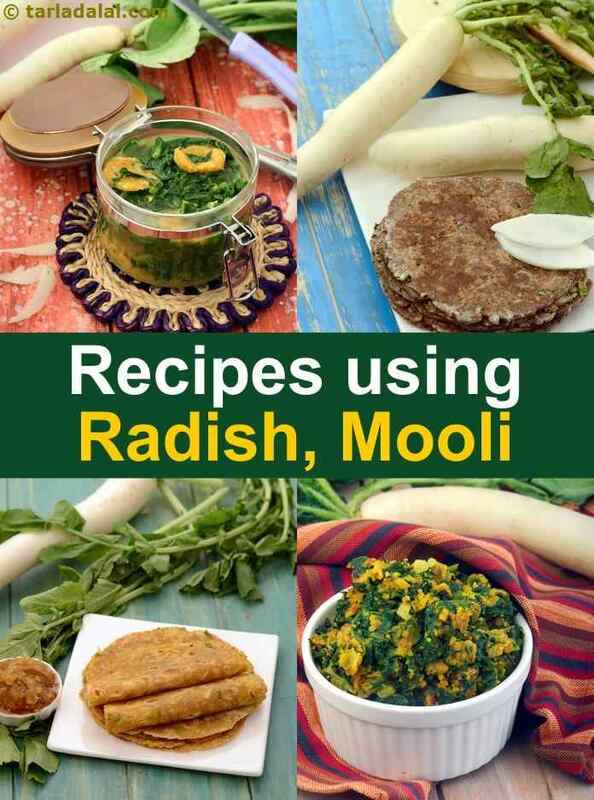 radish recipes, Indian Mooli, Radish recipes. white radish recipes. Radish is also known as Mooli, Mula or Muli. It is a root vegetable with a crisp texture and a peppery hot flavour, which varies from mild to very strong depending on its age and type. white radish goes really well in theplas and parathas. Both radish and radish leaves are used in this mooli thepla recipe which is a famous healthy Gujarati paratha. Curds are added to enhance the texture and flavour of the theplas. Mooli paratha recipe is a traditional Punjabi roti made with grated radish, radish leaves and whole wheat flour. They work perfectly to carry in your tiffin box. Another good use of mooli is the combination with the healthy nachni flour to make radish nachni roti recipe which is great for weight loss. Mooli or white radish is used in Indian dals and kadhis. Mooli is used extensively in Rajasthani cooking and combines well with yellow moong dal to make a healthy mooli moong dal recipe. For those with hypertension, try this low salt mooli moong dal recipe. The Gujarati kadhi from the Bhatia community is called Bhatia kadhi which is made from mooli, toovar dal, curds and spices. It is a swwet and sour version with cooked toovar dal, curds and vegetables. The Mullangi Sambhar is an all-time favourite of the South Indians, especially those in Tamil Nadu where it is made very often. Being simple and easy, it is an everyday fare. The strong flavour and aroma of radish together with the spiciness of the sambhar masala make this a mouth-watering treat. Mooli is also used in salads. The mooli ka salad recipe is for mooli lovers as there is mooli and spices. Thats it. Enjoy our white radish recipes, radish recipes, Indian Mooli, Radish recipes given below.